Where do investment bankers and dandies alike go when they need serious, custom shoes ($750 a pair and up, serious)? not to Yorkville. instead, they descend a staircase to a stone-walled workshop, in a Victorian mansion at Sherbourne and Gerrard, where Peter Feeney plies his trade. 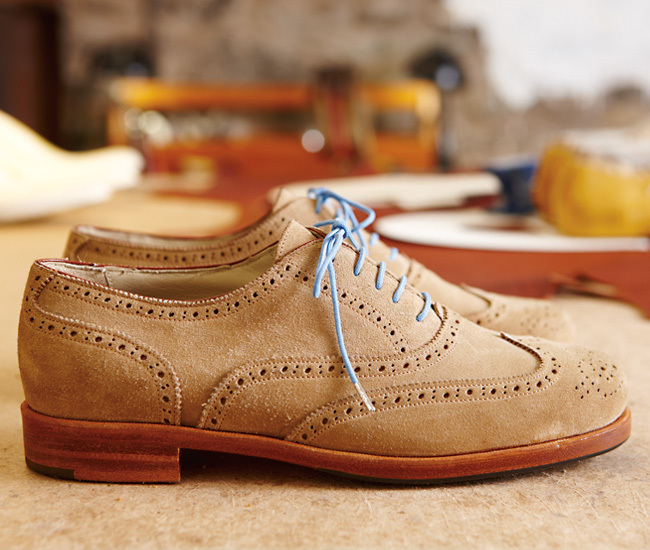 A modern-day cobbler trained in Florence, Feeney crafts bespoke oxfords, brogues and spectators for men and women. And he’s committed: each pair takes about 36 hours to make and will last well over a decade. Standard black leather (a Bay Street classic) is a common request, but always with one of Feeney’s signature twists: contrasting stitching or toecaps, coloured laces or understated tassels. And for the more daring, bespoke designs in pony hide or hand-dyed suede. Originally published in our Spring 2013 issue. Sign up to receive weekly news from Designlines, Toronto’s ultimate guide to modern design.